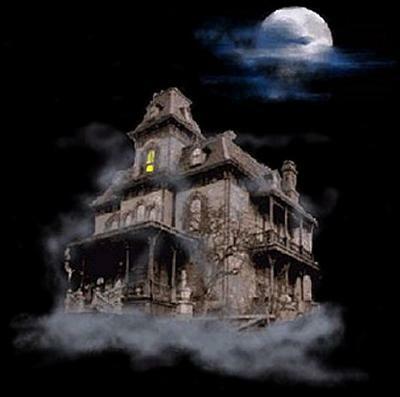 Sometimes when folks purchase a home, particularly an older one, they find themselves sharing space with a resident ghost. If the paranormal activity associated with the unseen spirit is particularly disturbing, they may be left scratching their head as to what to do about it. First of all, make sure the odd sounds and events occuring in your home are more than just natural events. If lights flicker, check your wiring; if doors slam closed or there are especially cold spots, check for drafts, if odd noises are heard, check to see whether it's just the house settling; and so on. Rule out all natural causes first. And before you begin, call on God, Allah, whomever is your ultimate source, and ask for protection. You will need a smudging stick, which is a wrapping of leaves that burns and creates an odor that will cleanse your home of unwanted spirits. Also have a bowl of water handy to douse the stick, if necessary. Walk around your home with the lit smudging stick and insist that whomever has remained from the spirit realm leave your home immediately. Loudly proclaim that it is your home now and all others must leave. Inform your spirit(s) that they need to go to the light, that family and friends who love them will be waiting with open arms for them. Most people don't realize that they share their home with a ghost(s). Oftentimes, people are not in tune to such things and even if they are, they may find that the spirit causes no problems and they learn to co-habitate happily together. My daughter and her family purchased a home built in the early 1900's. After only a few weeks, she saw a fair haired woman in a long, white dress walk along the patio, just outside the back door. She was quite alarmed and told me about it, since she knew I was more informed on such matters. I told her not to worry, that the ghost likely meant them no harm. Then one night when I slept over, I awoke in the morning and opened my eyes to see this same woman standing in front of me. I took it in stride and decided to dig up some information on whom it might be. During a trip to the land surveys office, I found the name of the woman and her family who lived in the home during the early 1900's, when such attire was commonplace. Her name was Isabel, she was married and had two children. Meanwhile, my daughter was becoming more unnerved about the resident spirit who took delight in playing with lights and other electrical equipment, and my grandchildren often spoke of seeing the children. I told my daughter that she needed to claim her space - to tell Isabel in no uncertain terms that it was her house now and she needed to leave. Since that day, there have been no other sightings of any of the ghosts. Although she did not use a smudge stick (sometimes, it's not necessary) it is most useful for eliminating feelings, emotions, etc. - residue left behind, especially in cases where an accident, violent quarrel or murder may still linger in the atmosphere of your home.